Josh Fox's "Gasland" Takes on Natural Gas: Is "Fracking" Polluting America? 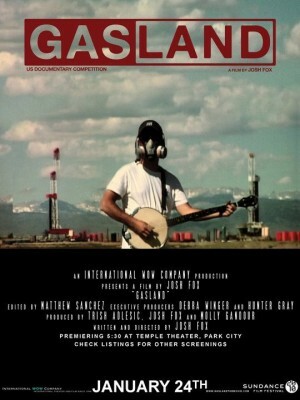 LOS ANGELES (CBS) This past January, Josh Fox won the Documentary Special Jury Prize for his groundbreaking work, "Gasland," at the 2010 Sundance Film Festival. His first ever documentary, now available on HBO, touches on a subject that has become increasingly important in light of the recent catastrophic BP oil spill - the environmental effects of the energy industry's efforts to extract natural resources. In "Gasland," Fox travels across the country exposing what he says are the unsafe drilling practices of the natural gas industry and its detrimental effects on the environment and communities. Fox's story began in 2008 after being offered $100,000 for a gas lease on his family's 19.5-acre home in Pennsylvania. In an effort to understand what the lease would mean to him and his family, Fox began investigating the effects of natural gas drilling in nearby towns. "The story from the gas companies, and those concerned in my area were totally radically different, that I decided to investigate about it. Gas companies were saying, 'this is no problem it's basically a fire hydrant in the middle of the field, this is good for the environment...' and then the environmentalists were saying, 'look there's a million chemicals involved, this is incredible destructive to the land, it can contaminate your water, air pollution, people are getting sick.'" His first stop was a neighboring town called Dimmick where gas companies had set up shop with drilling prevalent throughout the town. According to Fox, the town was "completely upside down. Water contamination, people could light their water on fire, Halliburton trucks everywhere, people were afraid of what was happening to them, they were feeling betrayed, a feeling like they got something completely different than what they signed up for." Compelled to understand the effects of this type of drilling called "hydraulic fracturing" or "fracking," Fox ventured to more than 20 others states where this practice occurs. He claims we he found was shocking. In communities where fracking is a common occurrence, negative effects were just as common, he says - sick communities where cancer rates were abnormally high, water that could be lit on fire, not to mention generally unsafe drinking water, animals losing hair, and much more. According to Fox, there are 450,000 of these gas wells across the country, with a proposal for 100,000 more in New York and 100,000 in Pennsylvania. Not surprisingly, the natural gas industry sees things quite differently. America's Natural Gas Alliance, an industry lobbying group, says the flammable water in Fox's film occurred because the home owner's water well was drilled into a "natural gas pocket." They say another damning scene in the film, in which Fox blames natural gas drilling for a massive fish kill, was also misplaced. An EPA report, they claim, blames coal mine runoff, not natural gas drilling. The group's entire rebuttal is here. In the film, Fox also emphasized how these practices of the gas industry are outside of the protections established by the Clean Water Act, "the primary federal law governing water pollution." During the Bush/Cheney administration in 2005, Halliburton - the company responsible for many of these wells and practices - established what is commonly referred to as the "Halliburton Loophole," a provision that exempts natural gas "fracking" practices from the Clean Water Act, Fox says. The Natural Gas Alliance claims they are not operating outside the law. Some have found his film to have hints of Michael Moore sensationalism, and obviously, Fox has come under the attack of gas companies for a variety of charges. However, he hopes that his journey can help provoke awareness, change and pass new laws including the "frac act", which would re-regulate the industry under the safe drinking water act.